I think most sweet recipes have personalities. Ice creams are light and playful, brownies suspicious and full of desire, and muffins are sturdy, the utilitarian farm-girls of recipe lexicon. With less sugar than their cupcakey counterparts, they are also something that most people feel they can indulge in on a near daily basis. I send a muffin to school with my Kiddo each day, and it is true that if I can bake it into a muffin shape, he will probably eat it. I wasn't really intending to share this recipe. It's been around the block a few times - developed by Kim Boyce in her stellar whole grain baking book and posted by The Wednesday Chef where I plucked it up to help it continue on it's way. I've been testing a new batch of recipes for Andrea Lynn for her forthcoming book on artisan sodas. 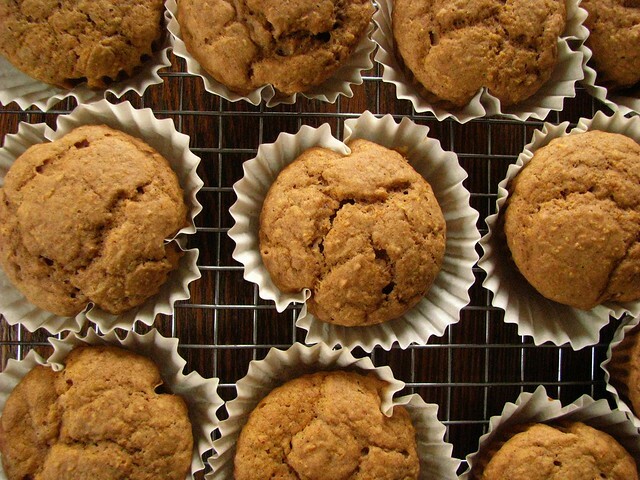 Using up an experimental sweet potato, I was pleasantly surprised at both how delicious and soft these muffins were, and at my son's enchantment with them. He wanted to eat three after he got home from school yesterday, when they still sat on the cooling racks before their transfer to the freezer. I let him have two, only because it made my heart so happy. He told me they were "as good as Alterra on the East Side's", which is pretty high praise. If I'm going to eat a non-homemade muffin, I go for Alterra's too. 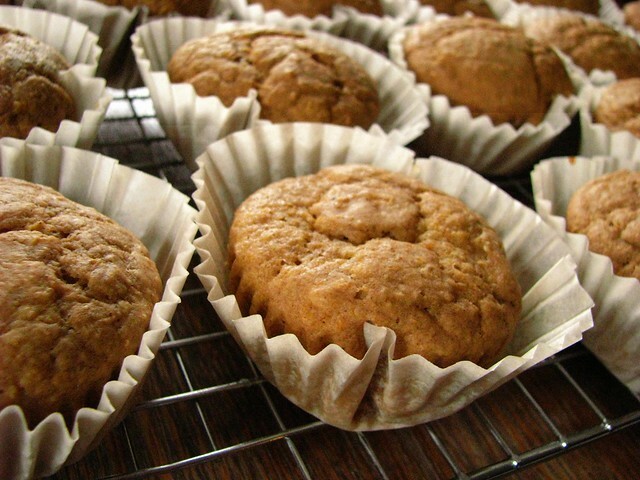 I'd suspect you could use any orange vegetable that's been pureed in these muffins, so long as they equal about a cup total. Since I was using up about 6 oz. of grated sweet potato, I simply boiled it in a little water for about 20 minutes until it was soft enough. I used my immersion blender to blend it smooth, it was a little on the thinner side of vegetable purees but I suspect it added to the softness of the muffins. I also had to omit the dates, since my picky Kiddo will not eat them. I recently put them in granola, and he patiently picked out each one. Really. Every little tiny chunk of date. Dates would make these extra excellent however. Sift the flours, baking powder and soda, and spices over a medium sized bowl to combine. In another medium sized bowl, cream the butter and sugars until the sugar starts to dissolve, about 3 minutes. In a 2 cup glass measure or small bowl, combine the yogurt, egg, vanilla and pureed vegetable, and mix to blend. 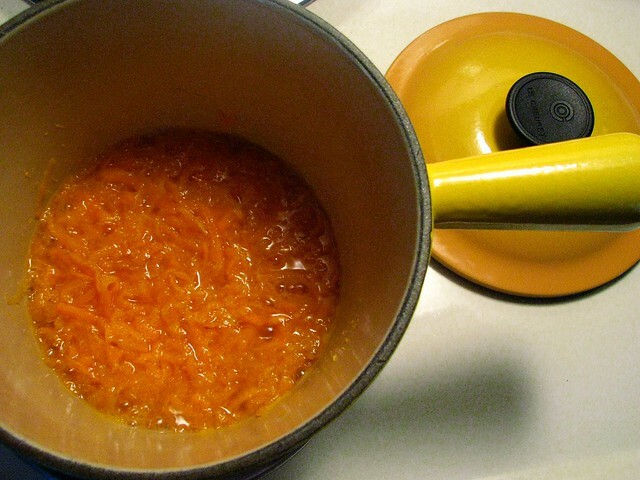 Add the dry and wet ingredients alternately to the bowl with the butter, beginning and ending with dry ingredients (3 installments of dry and 2 installments of wet ingredients). 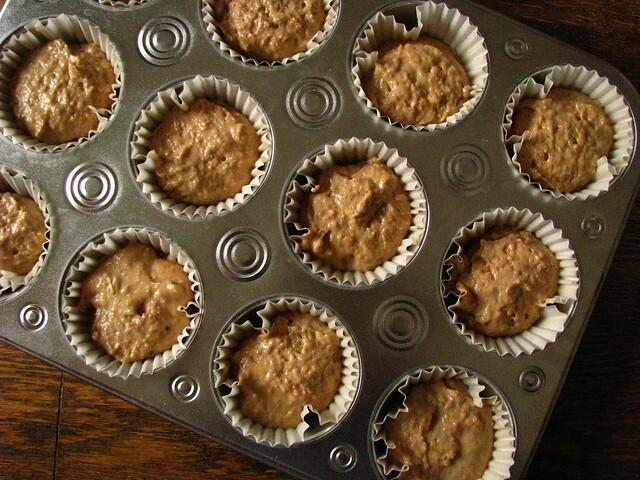 Portion into greased or paper lined muffin tins, and bake for 25-30 minutes until a tester comes out clean. Remove from tin and cool completely on a wire rack. Surprises arrive in my days like these muffins, which really appeared out of my desire for not wasting, and took advantage of an oven that was already on. So my apologies for yet another muffin posting, which the food blog world is certainly full up on. But their sturdy, good-natured selves are welcome in my world, their balanced nutrition and hints of sweetness complements to my freezer for quick bites and snacks.